Capacity up to 4 people. This spacious 70m2 suite is perfect for those clients looking for a more spacious room. Ideal for families. 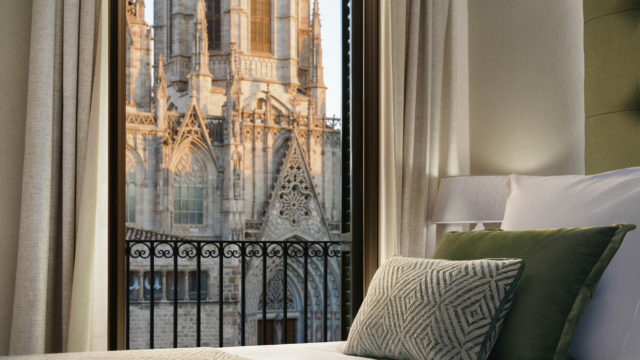 It has same facilities than the rest of rooms but also stand out its 4 balconies which offer a great luminosity throughout the day in the whole room and from where you can enjoy spectacular views of the Cathedral. The Grand Suite has two independent areas: the bedroom with a large and comfortable bed and a large living room that offers guests a magnificent space in which to relax or entertain. This room also offers a large bathroom, separated from the bedroom by a translucent glass and an elegant bathtub and large shower.